In the work and study most people want to print huge number of documents. Unfortunately, the ink in the printer is not eternal. Autumn it is important that you always know how much ink remained in the cartridge, because otherwise you risk to be trapped: at the critical moment you will not be able to print any pages. Most of the modern equipment, in particular printers, comes complete with special programs, which allow you to monitor the ink level. If the printer began to print fuzzy images, so it's time to check the cartridge. In that case, if you purchased a printer equipped with its own display, the problem is simplified in several times. Just go to the desired item in the equipment configuration, and display the ink level on the screen. For example, in devices of the Epson brand is done with the button Setup. 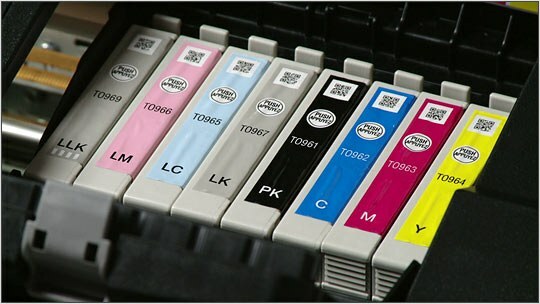 Select Ink Levels, which translated means "ink", and wait for the result. If you weren't so lucky with the instrument, use the Status Monitor, which can be found on the CD with drivers for printer Canon and Epson. Install it and run it. Go to the control panel and find the icon of the icon of the printer. Double-click the left mouse button will open the diagram, which will contain information on the amount of ink in the cartridges. The owners of the firms HP printer can also use a special program. You can find it by opening the all programs list and selecting HP. Then click on the tab that is labeled "Estimated ink level" and wait for the opening graphics. Remember that this is only indicative data. So it is not necessary to wait for the full waste cartridge. In that case, if you have time to change the cartridge for a new one, referring to the services of another manufacturer, then the above program will not help to determine the ink level. We can only hope that the new cartridge equipped with a housing made of translucent plastic, through which you can see the amount of remaining toner. In order to avoid problems, carefully read the specifications when purchasing the device.